I’ve been to a lot of bad Bulls drafts. Mark Randall, Byron Houston, Travis Knight, Marcus Fizer and Tyrus Thomas come to mind. 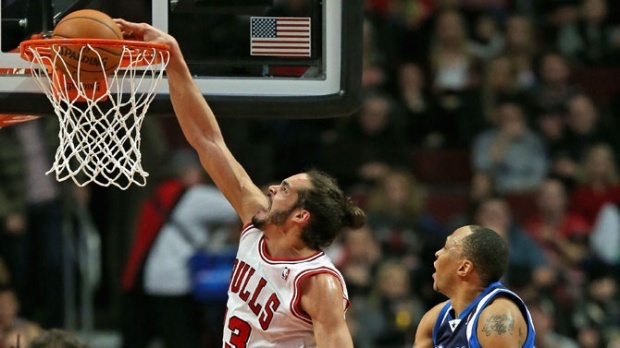 Thursday night was a very good one as the Bulls pulled out a minor coup and traded their Nos. 16 and 19 draft picks for the rights to national player of the year, Doug McDermott of Creighton. It’s a very good draft because the offensively challenged Bulls got the player arguably considered the best shooter and scorer in the draft, retained flexibility to remain a strong contender in free agency to acquire a player like Carmelo Anthony and, just as importantly, strengthened their position if, as many expect, Anthony decides to remain with the Knicks or go elsewhere. It was clear Bulls coach Tom Thibodeau, who worked with the senior McDermott at USA Basketball last summer, was excited about the addition and was plotting ways to blend in McDermott immediately. It’s questionable whether McDermott could move in as a starter as a rookie, though not inconceivable. But what he does is provide another strong shooter, even if coming off the bench, and likely along with Nikola Mirotic, who many in Spain now seem to believe just played his last game overseas in the Spanish playoffs and will join the Bulls next season. That, however, remains unknown with the Bulls. But the addition of players like McDermott and Mirotic begins to provide the Bulls with substantial depth and additional scoring to go with the return of Derrick Rose, who Thibodeau said Thursday at the draft will practice with the Bulls summer league team at the Berto Center next week and then play with USA Basketball in Las Vegas, where Thibodeau will be an assistant coach, starting July 28. The Bulls’ priority is believed to remain an attempt to lure Anthony away from the Knicks as a free agent. The feeling is the Bulls have a reasonable chance. Thursday’s move should help as McDermott could be an appealing piece in a sign-and-trade deal with the Knicks to get Anthony his full contract. Perhaps Mike Dunleavy as well since he has an expiring contract. Though the main piece would have to be the contract of Carlos Boozer, which seems like it would be unappealing to the Knicks at almost $17 million. Though the Bulls used their two first round picks in this draft rather than being able to include them in a potential package to the Knicks, the Bulls have possibly two first round picks in 2015: Their own, which they can swap with Cleveland if the Cavs are not in the lottery, and a top 10 protected pick from Sacramento. Though both those picks depend on how those teams play next season. It would seem unlikely as hard as the Bulls worked to trade for McDermott that they would be inclined to include him in a trade, even for Anthony. It’s also difficult to believe the Knicks can face their fans giving up the popular Anthony and coming back primarily with Boozer and only possible future first round picks. The Houston Rockets, for example, would be trying to do a sign and trade that includes a high level player like Chandler Parsons along with draft picks. But it seems less likely Anthony would want to be in Houston as he prefers a major market. Miami also could make a run to unite Anthony with good friend LeBron James depending on salary accommodations made by Heat players other than James. Those scenarios will play out in likely dramatic fashion starting 12:01 a.m. Tuesday. There was less speculation about a potential trade for Minnesota’s Kevin Love as all indications around the NBA are the Timberwolves would keep Love for now and hope the Warriors change their mind about trading Klay Thompson. The Bulls do not appear inclined to diminish their team by trading players like Taj Gibson, Jimmy Butler and Dunleavy to obtain Love. And Minnesota doesn’t seem interested, anyway, as they supposedly have been asking around for offensive players and shooters in any talks regarding Love. But the Bulls are well positioned to put together a deep and strong team that can more mirror the successful San Antonio teams of recent years. Of course, that all assumes the healthy return of Rose, who is on schedule with all his rehabilitation and playing basketball regularly. If the Bulls use amnesty for Boozer, they’d have perhaps $12 million in salary cap room. While it would be a coup to land a scoring star like Anthony, the Bulls have several needs. They lack a backup center and a backup to Rose. Plus even with Anthony, there is no shooting guard on the roster. If they were to acquire Anthony in a sign and trade (the Knicks could not do one because of financial restrictions before their trade of Tyson Chandler Wednesday), they would remain over the salary cap and could use the mid level exception for Mirotic. That, of course, would be ideal, though difficult to see how it makes much sense for New York. If the Bulls were to use amnesty and then try to fit Anthony into the remaining salary cap space, he’d have to accept substantially less salary, perhaps almost half as much as he could earn in New York. And the Bulls presumably would be sending out contracts just to create salary cap space. Unlike in 2010 when they did so with Kirk Hinrich and were burned, it seems less likely they’d pursue that avenue as intently this time. But with salary cap space from amnesty without going for Anthony, the Bulls could begin to fill several needs, like bringing back Hinrich or D.J. Augustin, finding a backup center for more than minimum salary, a shooting guard as there is an exception of close to $3 million for teams under the salary cap and still have enough to pay Mirotic a competitive contract. All indications seem to be that Mirotic could come to the NBA for next season. Those manipulations would put the Bulls in position to have at least a 10-deep team of regulars and not have to use players big minutes as they likely would have to with a smaller roster that included Anthony and minimum salary players. All that will play out over the next few weeks. And as Forman said there are numerous scenarios more dependent on the salaries free agents would demand and the available salary the Bulls could have. It’s unclear at this point. To do the McDermott deal, the Bulls had to take Anthony Randolph, a lanky 6-10 forward who was a highly touted lottery pick in 2008 but has drifted around to four teams. The Nuggets insisted on that given they needed the roster spots as part of the deal. Randolph could prove useful. Though even if the Bulls had to release him for cap space, they would be allowed to stretch out the cap room over three seasons. With giving up two picks for one and the possibility of stretching out payments, if necessary, it’s close to the same for the Bulls regarding salary cap space in free agency. Though the big news was McDermott. The Bulls were effusive about being able to obtain McDermott. Teams generally say they are excited no matter whom they draft. But this was a situation in which the Bulls filled a perfect need with shooting and a ready to play senior. That sort of player had been missing in previous drafts. And it seemed even on draft day and until minutes before the pick, the Bulls weren’t going to be able to make the deal. The Bulls, as had been often reported, were trying to use both picks, Nos. 16 and 19, to trade up. It rarely happens because unlike in other sports, the NBA drafts generally have high level players in the lottery or part of the lottery and rarely beyond. You can get good players after pick No. 14, but it’s hit and miss and rarely players who would potentially become high level starters. Everyone knew the Bulls, last in the league in scoring and shooting last season, were desperate for players like shooting guard Nik Stauskas or McDermott. But shooting has become so vital in the NBA that both were considered top 10 picks. Stauskas was selected eighth by the Sacramento Kings. McDermott was widely expected to go ninth to Charlotte, which was 25th in shooting last season. But the Bulls got a break when Orlando at No. 4 pulled a bit of a surprise and passed on point guard Dante Exum. Kansas highlight guard Andrew Wiggins went No. 1 to Cleveland. And though many, including me, considered Jabari Parker the best prospect with Joel Embiid having health issues, it appeared the Cavs got scared off with Parker apparently favoring being taken by Milwaukee. It’s all they needed: Another star forward who wanted out of Cleveland. So Parker went No. 2 to the Bucks and Embiid went No. 3 to the 76ers, who continue to hold off competing to get more draft picks. The Magic was widely expected to take Exum to combine with Victor Oladipo in the backcourt, though they later would trade for guard Elfrid Payton. Utah had been ready to take Indiana’s Noah Vonleh, an athletic power forward. But when Exum slipped through, the Jazz grabbed him. The Celtics and Lakers at Nos. 6 and 7 had longtime favorites with Boston high on Marcus Smart and the Lakers for Julius Randle. They got their guys. So the Kings at No. 8 took the shooter, Stauskas. The Kings selected shooting guard Ben McLemore last season and supposedly want to package one now for Rajon Rondo with the Celtics taking guards. So now came Charlotte at No. 9 preparing to take McDermott. But with Vonleh sliding, they saw an opportunity to add a versatile big man and insurance if they cannot retain Al Jefferson, who will be a free agent next summer. So suddenly McDermott was in play for Denver at No. 11. And they had a glut of shooters after acquiring Arron Afflalo earlier in the day. The 76ers were after Charlotte, but they didn’t want ready to play players and would end up with another player not coming to the NBA yet, Dario Saric. So everything broke for the Bulls to move up with their two picks after being rebuffed constantly by all the lottery teams. Denver wanted the Bulls to take Randolph for the roster spot and to save some money and also asked for a second round pick. As it turned out, the Bulls added a player with their second round pick at No. 49 who could prove useful, Cameron Bairstow. The Australian power forward from New Mexico could be good front line insurance as the Bulls also work to get 6-10 forward Greg Smith back from knee problems. So the Bulls continued to build depth and just with Rose and Mirotic and now McDermott have added considerable potential scoring and shooting as, especially McDermott and Mirotic, are accomplished three point shooters. McDermott averaged 26.7 per game last season to lead the nation, shooting 46 percent for his college career on threes and as high as 49 percent as a junior. He was one of three college players all time to have more than 3,000 points and 1,000 rebounds. He won basically every collegiate post season award available, overall 13 national honors. And Thibodeau emphasized he’s a much more skilled and versatile overall player and defender. Scouts have likened him to a better and more versatile version of Wally Szczerbiak, who was an All-Star with a 14-point career average and 19 his first six seasons. As a sophomore, McDermott shot more than 60 percent overall despite being a jump shooter. And so it turned out Tyrus Thomas paid off. 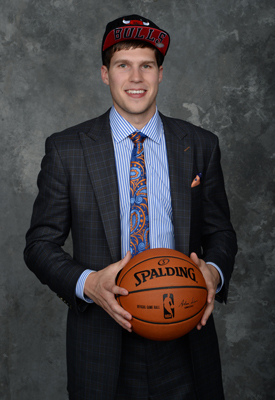 The Bulls were able to make the deal for McDermott thanks to the No. 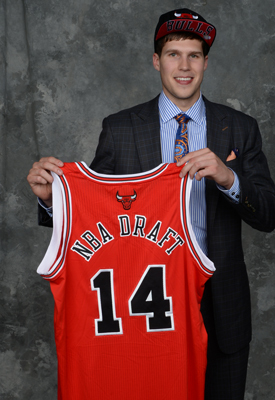 16 pick, which the Bulls acquired from Charlotte in the trade of Thomas.